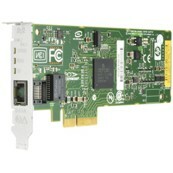 The HP NC373T is a high performance PCI Express Gigabit Ethernet multifunction network adapter suitable for either standard or low profile slots in ProLiant servers running in a twisted pair (copper) network environment. In addition to delivering standard Gigabit Ethernet networking, the NC373T supports TOE (TCP/IP Offload Engine), for Windows only, and Internet Small Computer System Interface (iSCSI) over a single network connection making it a multifunction Ethernet server adapter. Besides its multifunction capabilities, the NC373T ships with all the advanced server features that ProLiant customers have come to expect, such as support for failover and load balancing, Pre-Boot Execution Environment (PXE), large send offload capability, multiple VLAN tagging, auto-negotiated 10/100/1000Mbps Ethernet speeds and IPv6 packet transmit and receive support (excluding all offload capabilities).